I’m proud of my daughter for graduating. You’ve grown up so fast, maybe too fast. But now it’s time to conquer the world. Now it’s time to party hard and have fun. You’ve earned it. I could list the opportunities my daughter has, but it wouldn’t fit on this card. Congratulations on your graduation! Every day you make me proud, but today is the day I can tell everyone. 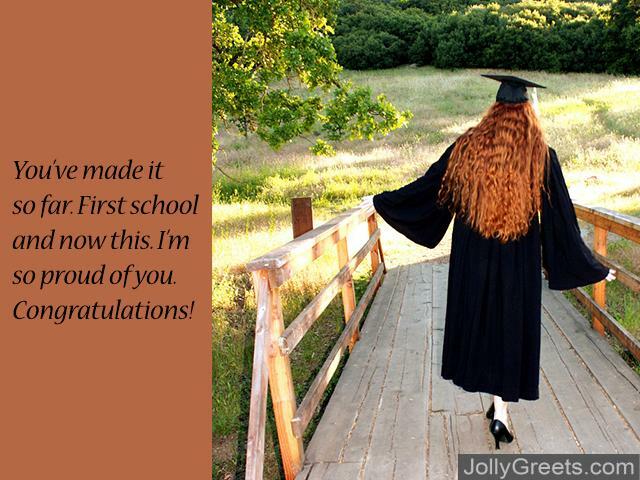 Congratulations on finishing school! Congratulations on how well you balanced work and play! Year after year you’ve worked hard. Congratulations on making it pay off. From the first day of school to the last, you’ve made us so proud. 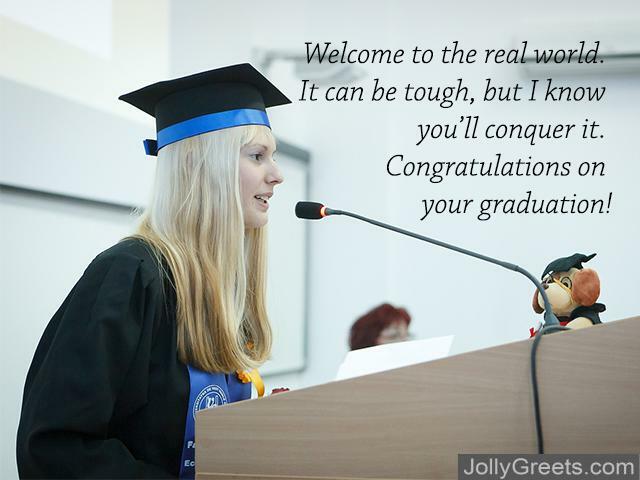 Welcome to the real world. It can be tough, but I know you’ll conquer it. Congratulations on your graduation! You’ve made it so far. First school and now this. I’m so proud of you. Congratulations! You studied hard and it paid off. Now you can smile and receive your diploma. Congratulations. You deserve it. I can’t believe my daughter has made it this far! Every day you make us prouder and prouder. Ever since you were born we knew you’d be a success. Thank you for proving us right! Well done! And remember us when you’re finally living life! All the work was worth it. All the studying and the long nights in. Now, you can smile at your graduation and have the life you always wanted. Life begins today, only today there’s champagne. You’ve finally made it! Congratulations on your degree! One more milestone completed. Congratulations on your degree! Every day you make us proud, but today there’s champagne and garden parties. It’s time to dance to your favourite songs. Take a break before you conquer the earth. We always had faith in you. You’ve proven us right every single day. Gradu-and what? You’re a graduate now!! You’re a master of so many things, now you have a piece of paper to prove it! Not only are you now a master of your subject you’re also a master of your family’s hearts. Another year has come and gone, and another qualification to carry with you. Congratulations on your masters. You’ve made it! You’re ready for the future! Keep us in mind when you’re changing the world! A Master of the Arts! Ever since you could write, we saw your creative potential. Now the whole world can see it too. A Master of Sciences! You’ve always been intelligent and had a critical eye. We’ve always known that one day that you would use it to help the world. Doctor Doctor my Daughter just got her PhD! Congratulations on making it! It’s taken a while, but all the blood, sweat and tears have paid off. Congratulations on your PhD! Doctor Daughter, you’ve made us proud. Education has been with you for your entire life. Now you have surpassed it and can make the world as proud as you make us. You’re in the height of your field. Congratulations on your PhD. Since you’ve been small we’ve known you’d make it this far. You’ve proven to everyone that you can do amazing things. Never stop. Congratulations on finishing your PhD. We always knew you could make it. My heart is swelling with so much pride that I might need a Doctor. Can you help? Your thesis was incredible. Well done on your PhD! Could you make it any further? You’ve dedicated so much to your studies and now you’re here. Congratulations! Mum has already told all of her friends how incredibly intelligent you are. You’ve made us so proud. Congratulations! You are a pioneer, so continue your quest into a new world of knowledge. You know things most could only dream of. Congratulations on bringing your knowledge to the world. Your wisdom has grown alongside your knowledge. But your kindness and light have never faltered. So today is the day you graduate. You’ve done great. Now it’s time to tackle fate. First school and now this. Congratulations on your amazing diss. You never did settle for less. Graduation time. You’ve had so far to climb. So forgive my rhyme, but you’ve always been in your prime. It’s the end of one step and the start of another. Prepare for an amazing summer. You have so much you can discover. And don’t forget to thank your mother. You are so knowledgeable. Time at Uni isn’t always stable, but you threw your cards onto the table. Because of this, a great life you can enable. Your knowledge has grown. Day by day it has made us proud. All the things that were unknown. Now you can shout them clear and loud. This is a message of goodwill, now go out there and make some dollar bills. It’s time to party hard, just don’t ruin the backyard. We hope you enjoy this card. You’ve written your thesis. Your hard work was ceaseless. Yet your knowledge still increases. So go out there and create more masterpieces! You’ve finished school. Isn’t that cool? Seriously, you rule! You’ve got a degree. Now you’re free! You’ve filled me with glee. Try not to forget me! You’ve got your Masters. You’ve finished one of life’s chapters. I hope the rest of your life is filled with laughter. You’re a Doctor. You’ve always been a great scholar. Now you can experience everything life has to offer. You’re a professor. A real knowledge processor. Never settle for what is lesser. Because you are a joy possessor, and will always be a people impresser.